Although new garage doors come in a wide variety of tones, future renovations can throw off the color scheme of your home’s exterior. As you move through the renovation process, you might feel inspired to update the garage door color to match the other changes you made to the exterior surfaces. Fortunately, switching the garage door color is quite easy with the right supplies and know-how. 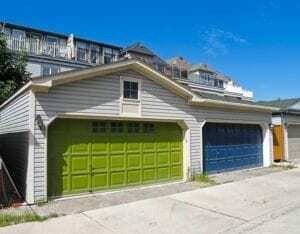 You just need to select a color scheme, gather supplies and apply the paint to drastically alter your garage door color. Here’s what you need to know about completing this project. To create a cohesive color scheme, select a garage door color that either contrasts the siding and complements or directly matches the trim and shutters. If you want your garage door to perfectly match your trim and shutters, you can even have a custom paint color created at the hardware store. To have this custom color made, you just need to bring a small paint chip in the desired tone to the mixing specialists. For a two car garage door, you will need about one gallon of paint. If you are covering a dark color with a lighter one, you will also need to pick up a gallon of primer to apply before the paint. You may also want to grab the paint supplies you will use for this project. Step 1: To protect the trim and siding, you will need to tape around the edges of the garage door. If you need to protect large portions of siding from paint splatter, use the plastic sheeting to create a protective barrier. Cover the garage door handles and hardware with a tape as well. Step 2: Place the drop cloth along the work area and place your painting supplies on top. Always stir the primer or paint before beginning to apply the mixture onto your garage door. Step 3: Whether you are starting with the primer or just jumping to the painting process, make sure to cut in along the edges of your garage door using the angled 2-inch paintbrush. Step 4: Apply an even coat of primer or paint to the remaining garage door surface. Allow the coat to dry. Step 5: Repeat the cutting in and painting process to finish with one coat of primer and two coats of paint. Step 6: Remove the tape and plastic sheeting after the paint feels tacky, but has not yet fully dried. If you want to change your garage door color, but do not want to commit to doing the work yourself, consider hiring a professional to complete the job for you. Alternatively, you can replace your worn garage door with a new one in the perfect style and color by contacting the pros at Action Garage Door Repair Specialists. To discuss your project ideas with a garage door specialist, give the team a call at 817-633-3119 or fill out the online contact form.